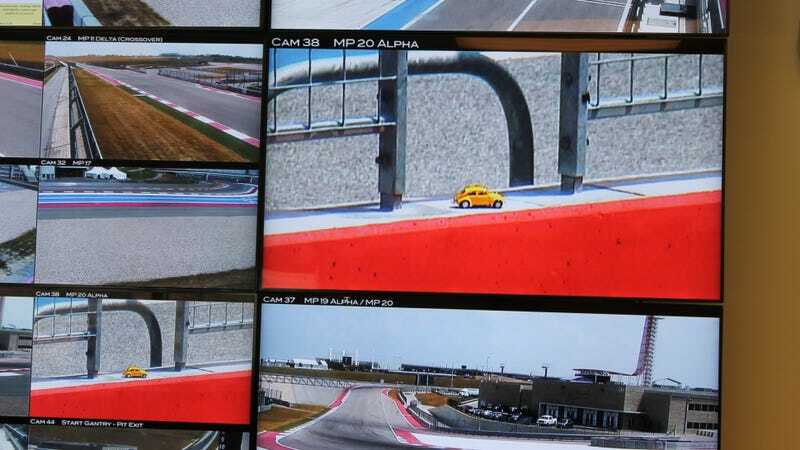 The Traveling Torchbug got a little tour of Circuit of the Americas’ timing and race control systems, thanks to Opponaut Clown Shoe Pilot. Here’s how you get super-mega-ultra busted for wiping out 42 feet of Tecpro barrier. First off, there’s the Race Control video wall, where 44 cameras can monitor anything you want to see out on track (except perhaps when a marshal ducks under the fence to pick their nose). It can also spot wayward traveling Beetles that are placed on the pit straight wall. Additionally, anything the marshals bust you doing gets displayed at the bottom left. If you’re lapping the circuit in a Volkswagen Beetle, the MyLaps timing system will tell you exactly how much slower you are than a Formula One car. You can keep up with the Traveling Torchbug’s full adventures on Live and Let Diecast here.